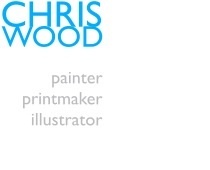 Chris Wood is a story teller, inspired by creation, the physical environment, the sea: how it moves, its power, shapes and ever-changing forms, the weather, the light, the colours, shapes and textures of the clouds, history, ships, yachting, the people he meets, the books he reads, personal memories, objects, tools and ephemera. He seeks to find answers but his work often represents a paradox between the celebration of beauty and our desire to harness or control it – in short, it’s often about struggle – physical, psychological or metaphysical. Process is fundamental to Chris’ work, which is often the result of hundreds of hours of research, notes, conversations, drawings and colour studies. He makes observational studies, field trips, takes photographs and gathers information from libraries and the internet.